The Brangwynne lab is focused on elucidating the fundamental principles underlying biological organization, with a particular interest in membrane-less organelles/condensates which form within living cells. Despite having no enclosing membrane, these structures localize biomolecules, including both RNA and protein, into distinct subcellular micro-compartments; examples include processing bodies, neuronal granules and germ (P) granules in the cytoplasm, and Cajal bodies, nucleoli, and PML bodies in the nucleus. We use experimental approaches together with close theory/computation collaborators to study the role of intracellular phase transitions in the assembly of these structures, and the impact of this phase behavior on the flow of genetic information (for a recent review on intracellular phase separation, see Shin & Brangwynne Science 2017, or watch our iBiology videos posted here). 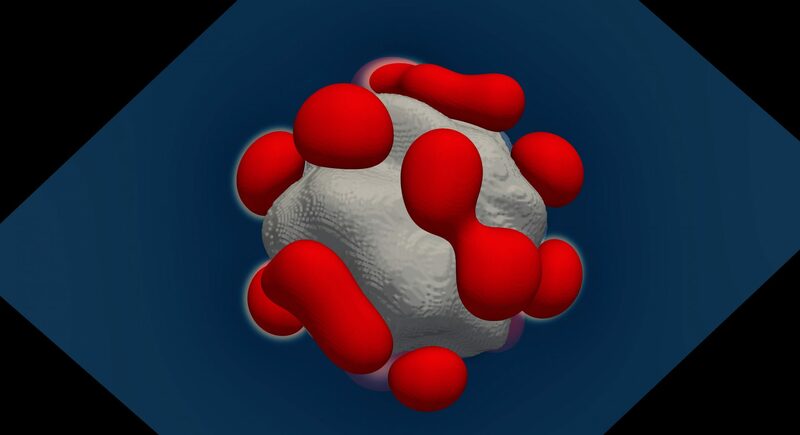 Our work combines the tools and techniques of soft matter physics and engineering with cutting edge cell and molecular biology methods, including advanced light microscope imaging and analysis. We are also heavily invested in the development of technologies for probing endogenous organelles, as well as engineering entirely new kinds of intracellular organelles for biomedical applications. Figure - Schematic of Brangwynne lab research. Our work is based in the biophysics of intracellular organization, but utilizes those principles in engineering approaches. These engineering approaches (e.g. novel technologies) can then be used to yield new insights into the underlying biophysical principles and functional biological consequences of emergent biomolecular behavior.